Banner Photo: Jacob Welch (center), lifetime member of the Delta of Kentucky chapter at the University of Kentucky, received the XXXIX National Lambda Alpha Scholarship Award honored by a check for $5000, a Charles R. Jenkins Certificate of Distinguished Achievement Award and a plaque. Jacob’s chapter faculty sponsor is George M. Crothers, Ph. D. (right). Also pictured Scott Huston, Ph.D (left). In the fall of 2014, I will begin doctoral studies in anthropology at Yale University. This ambition to further advance my education in archaeology was forged while completing my baccalaureate degree at the University of Kentucky. It was during this time that I was awarded the opportunity to spend two summers carrying out archaeological investigations for the Uci-Cansahcab Regional Integration Project (UCRIP). Through pedestrian survey, systematic test pitting, and soil chemistry analyses, director Scott Hutson and I have collaborated in investigation how Kancab and surrounding sites negotiated power with respect to Uci’s growing political domain. Since January, 2013, I have conducted research for the Tres Zapotes Archaeological Project (PATZ) directed by Christopher Pool. For this research I used QuickBird satellite imagery to locate archaeological and geomorphological features in the Southern Gulf Lowlands of Veracruz, Mexico – they are well-known for epi-Olmec and Olmec cultural occupation. I also spent two months on the Rio Amarillo Copan Archaeological Project (PARAC) with director Cameron McNeil of the Graduate Center, CUNY. During the 2012 summer field season, we investigated Late Classic and Post-Classic structures in the Copan Valley of Honduras to better grasp the occupational history of this area, and I specifically conducted and supervised a number of hillside excavations at Rio Amarillo. These experiences in Mesoamerica among many others will all play a crucial role in how I frame my dissertation research questions and conduct fieldwork at Yale University where I will build upon these experiences to implement a more well-rounded research design. For my doctoral research at Yale, I hope to join the growing number of researchers who explicitly focus on the commoner social universe. I believe that through studies of multi-household social units in Mesoamerican society and the interactions of commoners at various scales, archaeology can produce a more representative image of the Mesoamerican past. Three years of previous analyses have pointed me in this direction, as I have touched on the issue when documenting settlement patterns at the ancient Maya site of Chunchucmil. Work that I have conducted with Scott Hutson has demonstrated that through the study of commoner and elite houselots and the distribution of associated artifacts at Chunchucmil, these larger social units may be observed, specifically in the form of neighborhoods. I propose that this previous research focus on settlement patterns and social dynamics at urban sites is applicable to other metropolitan and rural areas of Mesoamerica; I hypothesize that through a combination of methodological and theoretical applications, archaeologists can understand the networks and broader social groups that framed people’s lives; and I strongly believe that there is a need to pursue these studies further to develop methods for identifying neighborhoods more clearly and assessing their economic, social, and ritual importance in Mesoamerica and round the world. Upon completing my doctoral degree, I hope to continue carrying out archaeological research, whether as a professor at a research institution or as a field director for a CRM firm. As an archaeologist, I will aim to establish myself as a collaborative researcher that facilitates exchanges with local communities and promotes meaningful dialogues with the public. 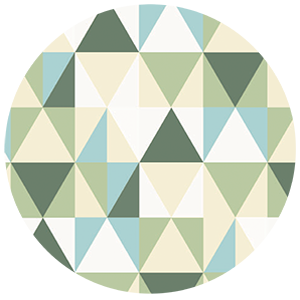 This inclusivity allows archaeologists and multiple publics to share a stake in the production of knowledge about their histories and have concern for their own cultural heritage. In a world in which cultural heritage is being overwhelmingly demolished through looting and the illicit trade of cultural objects, connecting people to their past is becoming increasingly important. Doing this allows the consumers of archaeological knowledge to comprehend the importance of their past and places them in a position of responsibility. 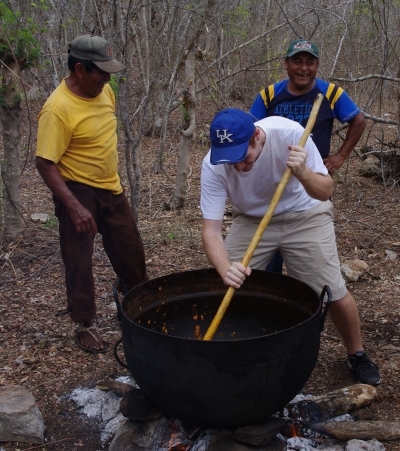 Jacob helping prepare a ceremonial maize stew with Alberto Kan Ketz (left) and Demetrio Canul Xol (right), in the forest near the village of Kancabal, Yucatan. Since the article ran in the Lambda Alpha newsletter last year, here is a list of additional accomplishments for Jacob. Received a pre-dissertation research grant from the Council on Latin American and Iberian Studies at Yale. In the Spring of 2014 he spent about 6 weeks working in Honduras, at the same site (Rio Amarillo, in the Copan valley) where he worked in 2012. Gave an SAA paper, of which he was first author, at the 2014 meetings. Worked on Scott Hutson's project for his third season. (Based on that work he'll be a co-author on an AAA paper this fall). Was a co-author on an Ancient Mesoamerica article that came out in fall 2014. In January of 2015 he went to Guatemala for training in Ground Penetrating Radar. Will be presenting another paper at the SAAs in April 2015.